BEIJING— China's economic growth slowed in the final quarter of 2011 to its lowest rate in 2 1/2 years as U.S. and European demand plunged and Beijing fought inflation. The world's second-largest economy grew by 8.9 percent in the three months ending in December, data showed Tuesday. It was the slowest expansion since the second quarter of 2009, when the economy grew 7.9 percent. China appears on track to avoid the "hard landing" of an abrupt slowdown but needs to do more to reduce reliance on exports and investment-driven growth by boosting consumer spending, analysts said. "Today's outcome seems to confirm a 'soft landing' scenario," said Frances Cheung of Credit Agricole CIB in Hong Kong. Slower Chinese growth could have global repercussions if its cuts demand for oil, iron ore, industrial components and other imports and hurts suppliers such as Australia, Brazil and Southeast Asia. In 2012, China faces "complexity and challenges" due to global malaise and domestic pressure for prices to rise, said Ma Jiantang, commissioner of the National Statistics Bureau. "We will face a number of risks that affect the steady growth of the Chinese economy," Ma said at a news conference. For the full year, the economy grew 9.2 percent, down from 2010's blistering 10.3 percent after communist leaders repeatedly hiked interest rates and tightened investment curbs to prevent overheating and inflation. Hit by an abrupt plunge in Western consumer demand, regulators reversed course in late 2011 and tried to prop up growth by promising more bank lending to help struggling exporters and avert job losses and the threat of unrest. The plunge in global demand, coupled with lending curbs, drove thousands of small Chinese exporters out of business and forced others to cut jobs, raising the threat of unrest. Analysts expect Beijing to try to stimulate growth this year with an interest rate cut or other measures to free up money for lending. Consumer inflation edged down in December to 4.1 percent, below July's 37-month high of 6.5 percent. That could give the government more leeway to stimulate the economy but it still was above the official 4 percent target for the year. The central bank last week promised pro-growth efforts to support Chinese entrepreneurs and small companies, though its governor warned conditions were uncertain. Also in 2011, China's urban population exceeded the number of rural dwellers for the first time, rising to 51.3 percent of the nation's 1.3 billion people, the National Bureau of Statistics announced. 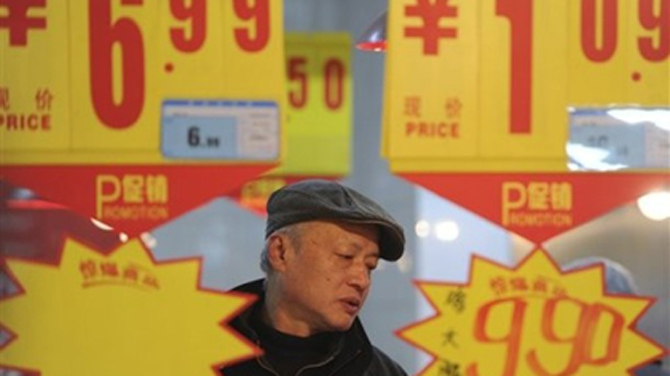 The slowdown was in line with government plans to cool China's overheated economy, Ma said. He said the "ideal situation" would be to keep growth between 8.5 and 9 percent and to keep inflation low. China's economic growth fell steadily over the course of the year, declining from 9.7 percent in the first quarter. Industrial surveys show manufacturing and exports contracted in November and December. A slowdown in real estate sales as the government tries to cool surging home prices has sparked concern about the impact on the overall economy. In a positive sign, growth in retail sales rebounded to 18.1 percent in December from November's 17.1 percent. "If we can rely more on domestic consumption, that will help the economy to sail through all these headwinds," said Credit Agricole CIB's Cheung. "In retail sales, there is quite an obvious pickup in growth, so that is where I think the comfort will come from." Also in December, growth in factory output edged up to 12.8 percent from November's 12.4 percent. "This all reaffirms our outlook on China for a soft landing in the second half of 2011 and in opening six months of 2012," said Moody's Analytics economist Glenn Levine in a report. "Export demand has cooled, but domestic demand is still running strong, led by public investment in housing and other infrastructure."